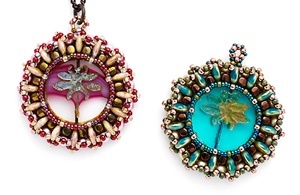 Coin toss pendant by Michelle McEnroe - Surround a flat focal with Rulla beads, two-hole lentils, pearls, and seed beads for a two-sided accessory. 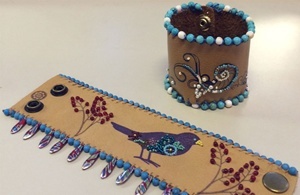 Bead embroidered stamped leather cuff by Abigail Engelking - Use rubber stamps to jazz up a leather bracelet, and then embellish the design with backstitch and a beaded edging. 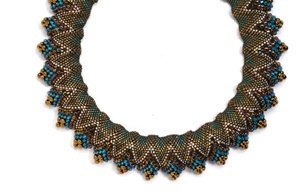 Surfin' the waves by Jimmie Boatright - Transform peyote stitch into a curved Cellini necklace simply by switching up the bead sizes. 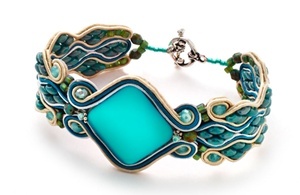 Serpentine soutache bracelet by Alexandra Sydorenko - Frame a Luna Soft cabochon with bands of soutache punctuated by pockets of SuperDuo beads. 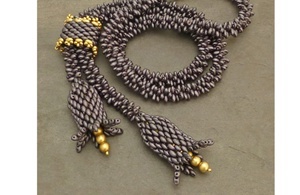 Twin flower lariat by Kerrie Slade - Work in tubular brick stitch with Twin beads for a lengthy necklace ending in a pair of flower buds. 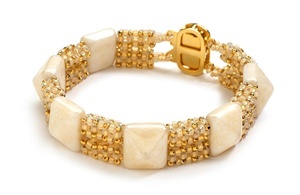 Studded bracelet by Dana Rudolph - Combine two-hole bead studs with cubic right-angle weave tubes for a really wearable bracelet or bangle. 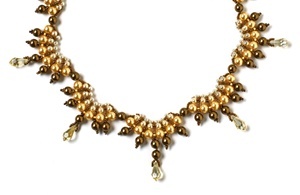 Pearl palisade necklace by Jane Danley Cruz - Stitch and string beaded bead caps with large-hole pearls for an instant classic. 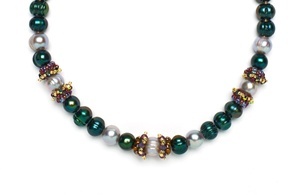 Scrumptious scallops by Carolyn Cave - Bring together four sizes of pearls for a necklace of fan-shaped components. 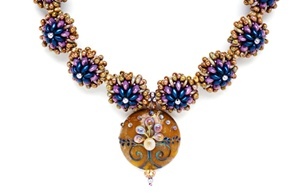 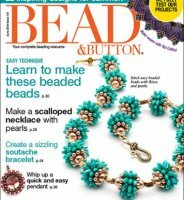 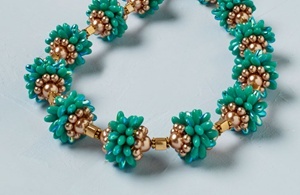 Rizo florets by Sandie Bachand - Whip up textural beaded beads using the new Rizo shape, and string them into a necklace. 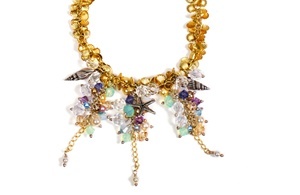 Charmed by the sea necklace by Alison Jayne Layton - Combine a pastel palette of crystals and pearls with chain and charms for the perfect summer accessory.